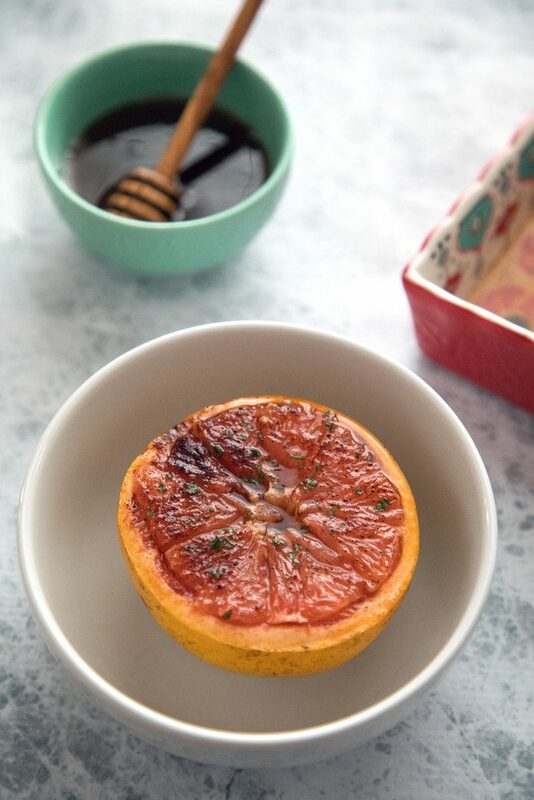 Roasted grapefruit makes the perfect breakfast, dessert, or anytime snack… Especially when it’s sprinkled with chili pepper for a kick, and drizzled with honey for some sweetness! I realllyyyy need to talk to the person who decided that two days was sufficient for a weekend. Who was this person and what did their life entail? And please give me their phone number ASAP as we need to have a serious discussion. I guarantee if he or she had polled the rest of us, we’d all have told them that we absolutely require three days per weekend. Right?? The way I see it, you need a day to hang out with friends and family, a day to run errands and clean/prep for the upcoming week, and a day to relax. It’s impossible to fit all of those things into two days and yet, most of us are forced to try week after week. Also, grocery stores would be less crowded if we had three days we could do our shopping instead of just two. Isn’t that reason enough to extend the weekend? I complain about going grocery shopping pretty much every week because it takes precious weekend time and it’s always packed with people. I can’t even leisurely stroll through the aisles checking out the new products without worrying that I’m in someone else’s way and I’d rather just stay in bed. Which is why I’m pretty excited that Peapod is sponsoring today’s post (see my first post with them here!). Instead of waking up at the crack of dawn to make myself look semi-presentable (don’t get me wrong, I’m not getting all gussied up for Market Basket, but I still need to put on real clothes and put a brush through my hair), I can just wait for my doorbell to ring. And yes, I keep my pajamas on for it. But really, I can’t even begin to tell you how much more relaxed I feel when I know I’m getting a Peapod delivery. 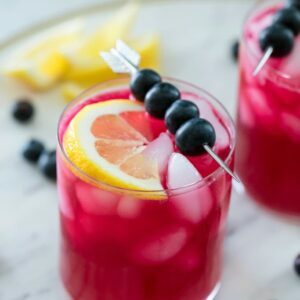 Sure, I still have to meal plan and figure out my grocery list (that’s a whole other story for another day), but knowing I don’t have to use precious weekend time to go to the grocery store feels absolutely heavenly. This time, I also conveniently and coincidentally planned my Peapod delivery for another ridiculously snowy day, so not having to leave my house was an added bonus. 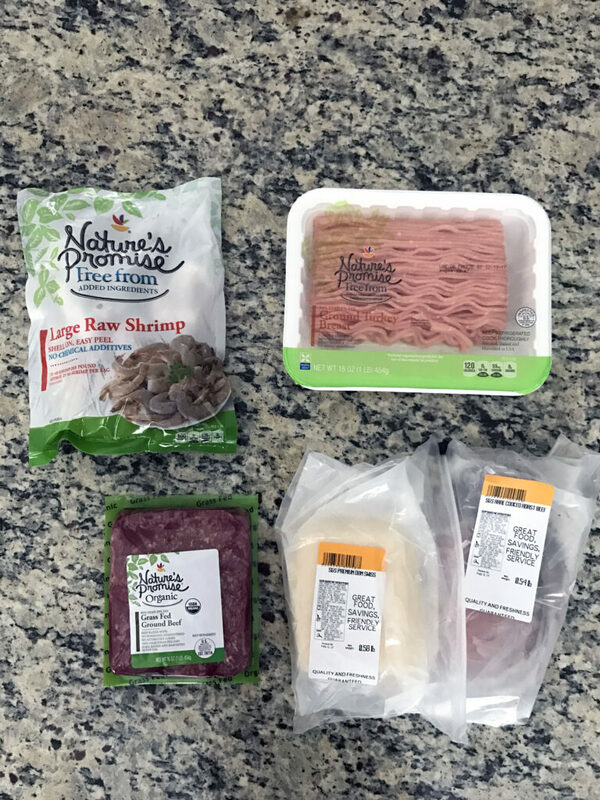 I set my delivery for early on a Sunday morning and was so happy to have my kitchen stocked by 8:00 a.m. Here’s my haul! 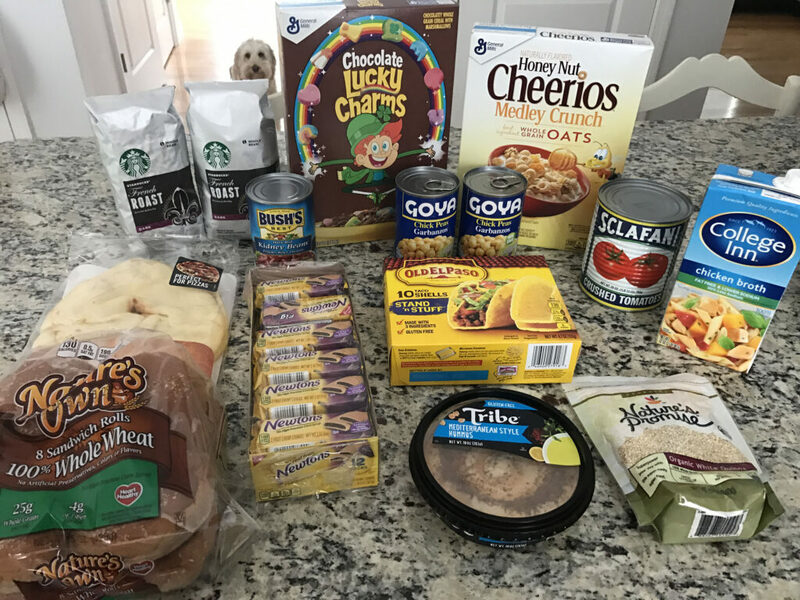 The groceries… Yes, I got Chocolate Lucky Charms and yes, my dog is absolutely adorable. One of the main reasons I love Peapod is because I can take my time checking out everything on the “shelves” without being pushed out of the way by a crazy lady who can’t wait another second to get to her Raisin Bran. The meat… Also, I don’t have to stand in the deli line, which is a huge win in my book. 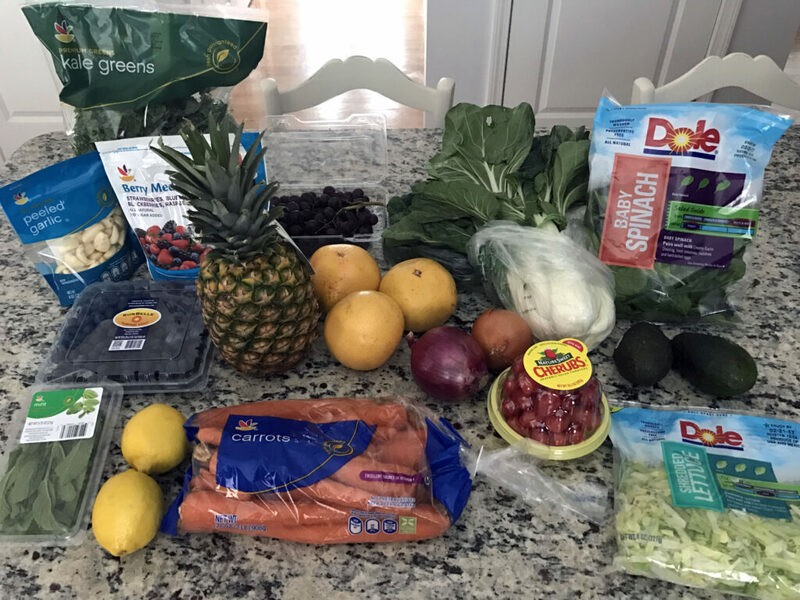 The produce… All of this freshness coming into my house for the week felt so amazing. If I don’t take time to grocery shop and meal plan during the weekend, I know I’ll be a mess for the upcoming week (AKA take out for dinner and bad-for-me lunches). So, it’s essential that I stock my fridge with healthy foods. But yes, I have a serious issue that when I see a new-to-me fun cereal, I can’t resist buying it. 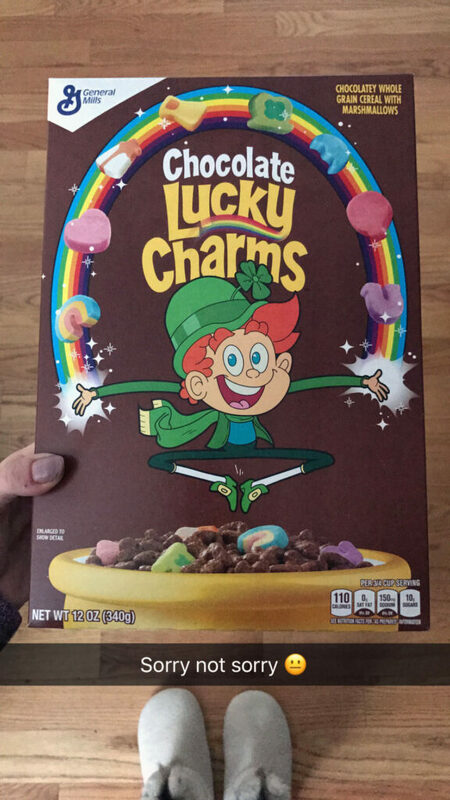 I was going to use these Chocolate Lucky Charms in a fun recipe, but Chris and I ended up eating them all. I don’t ever eat sugary cereal for breakfast, but love it as a snack or dessert. This was delicious and yes, it turns your milk chocolate. In the interest of fitting in as much as I can over the weekend, I often like to throw together simple and healthy breakfasts that are a little more than I’d do during the week, but don’t take all day. 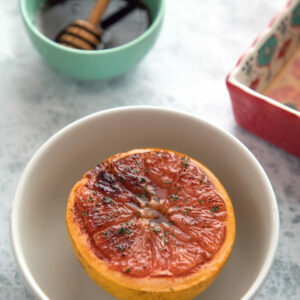 Broiled or roasted grapefruit reminds me of my childhood and is one of the simplest comforts in the world. I wouldn’t make it during the week… Because I don’t think I’ve ever turned my oven on before work. Seriously though, I really don’t think I ever have? But it’s still a super easy and quick start to the day. As you can see, I spiced my grapefruit up a bit! Before broiling it, I sprinkled some chili powder on top and drizzled on some honey. Then I popped it in the oven for a few minutes and added on a little chopped mint. 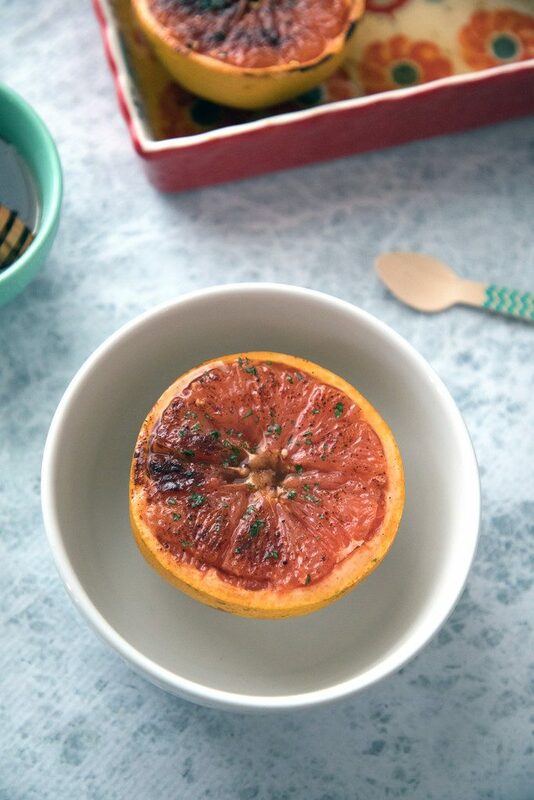 This roasted grapefruit is my definition of a simple pleasure. Some may think this is an unlikely and even “weird” combination… The tartness of grapefruit with spicy chili powder and sweet honey. But I promise you it’s worth a try. It’s always a good idea to wake your palate up in the morning, giving it a little bit of a challenge. It’s also a good idea to get your daily dose of Vitamin C. Pretty much everyone is sick right now, so do everything you can do avoid it! I fear there are still plenty of people out there who aren’t fans of grapefruit and to you, I say, try pink grapefruit! And also, roast it with honey. And then come back and let me know how you feel about it. Eating it this way is so different than downing a glass full of grapefruit juice. 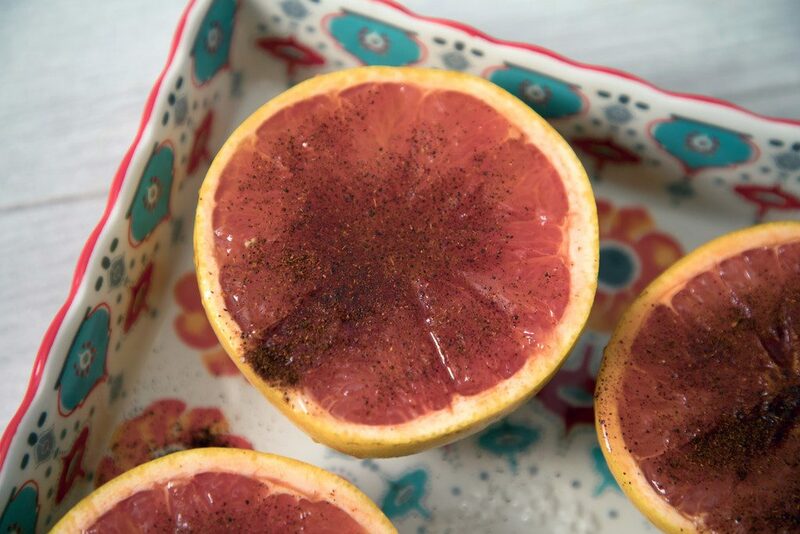 Growing up, we used to sprinkle brown sugar on grapefruit before roasting it. And then add a maraschino cherry on top. I still love grapefruit this way and I also love just eating it right out of the fridge. Honestly, I could eat grapefruit every day and I don’t think I’d ever get sick of it. Thank goodness it’s healthy or I’d be in trouble. 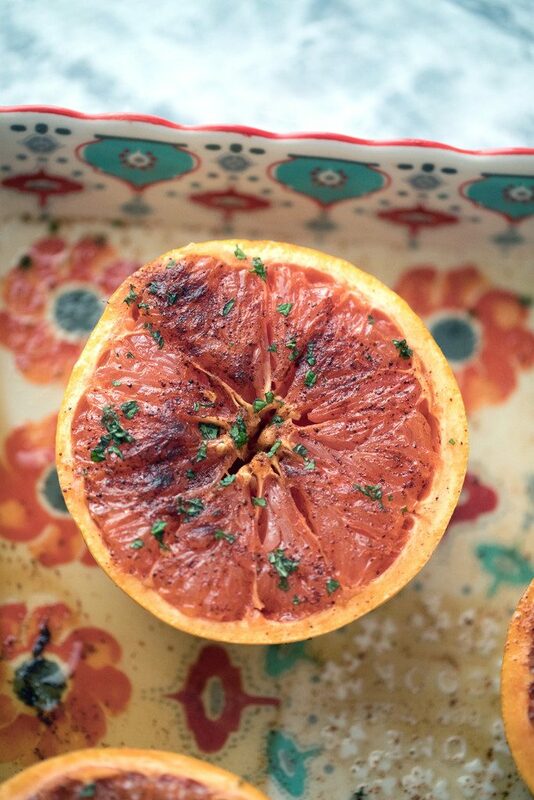 Really, you could do absolutely anything you wanted before roasting the grapefruit… You could add cinnamon. Or ginger. Just open up your spice cabinet and let your imagination take you away. Chris and I each ate a half of the roasted grapefruit and then put the rest in the fridge. I ended up taking a half to work the next day and eating it cold. It was also awesome cold as it still had the roasted flavor and spicy sweetness. And what better way to start the work day?? If I’m going to have to be at work five days a week, I’m going to at least make it delicious. It stinks that we only have two days of weekend, but since that’s probably not going to change any time soon, we need to figure out how to pack as much in as possible. Using Peapod is one way to do that (if you sign up for a PodPass you’ll get free delivery on all of your orders so long as you spend at least $100… But if you don’t have a PodPass, you can still get free delivery for two months!). And making simple and delicious snacks and meals is another. Anything that allows me to keep y pajamas on is a major win for me! How do you pack as much in as you can during a two-day weekend? Please note that Peapod operates in the following states: Illinois, Wisconsin, Indiana, Maryland, District of Columbia, Virginia, Massachusetts, Connecticut, Rhode Island, New Hampshire, New York, New Jersey and Pennsylvania. Roasted grapefruit makes the perfect breakfast, dessert, or anytime snack... Especially when it's sprinkled with chili pepper for a kick, and drizzled with honey for some sweetness. 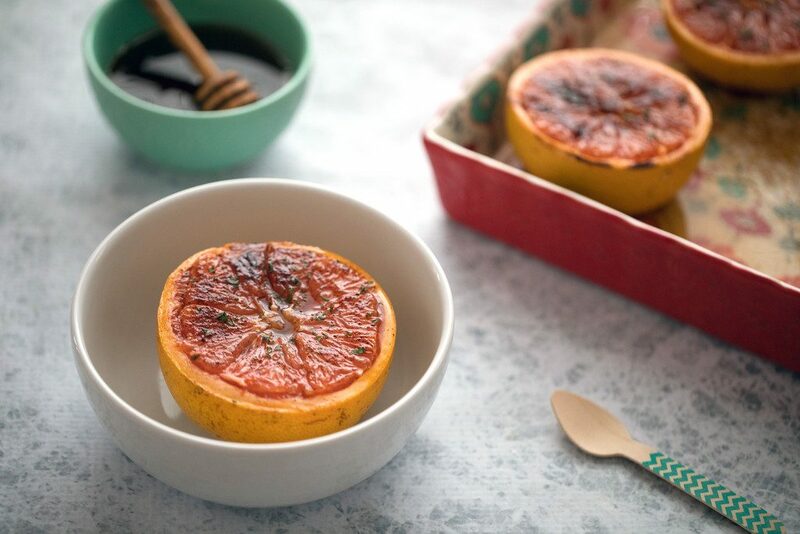 Place grapefruit halves in baking pan and sprinkle with chili powder and drizzle with honey, equally distributing among 4 grapefruit halves. Broil for 6-7 minutes in oven, until lightly browned. 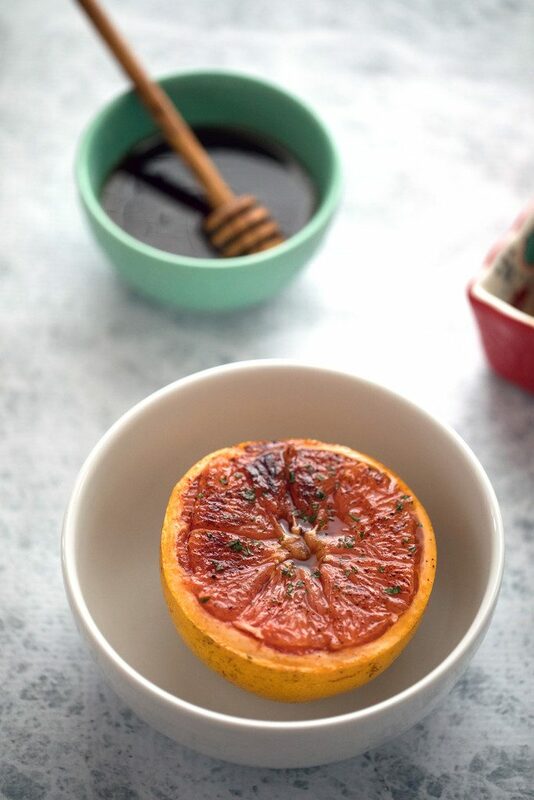 Sprinkle grapefruits with chopped mint. 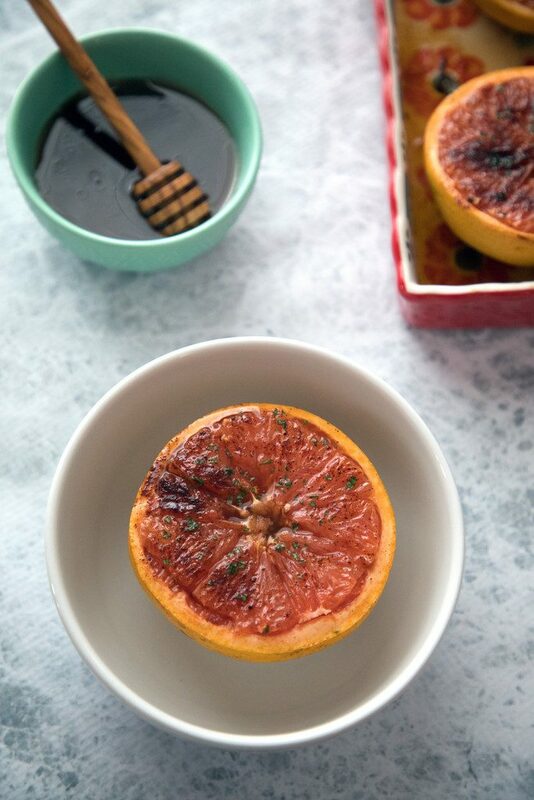 6 Responses to "Chili Honey Roasted Grapefruit"
The grapefruit with caramelized chili and honey on top sounds blissful! YES to all of your thoughts on the weekend! I’m a firm believer that we need at least three days to fit everything in. And your are selling me more and more on Pea Pod. I was just telling my husband the other day that we need to try it, at least once, just to see. Sounds so much better than standing at the grocery store. And this grapefruit is just gorgeous! I made a brown sugar version before, but I’m really loving the flavors of this chili honey version. 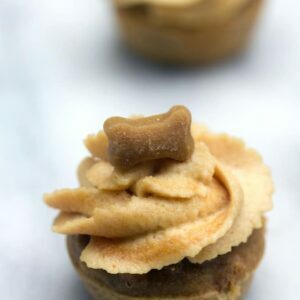 What a delicious breakfast or snack! 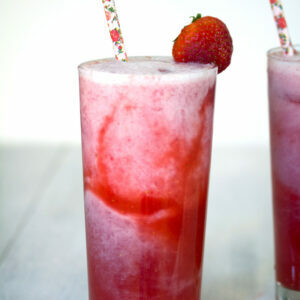 Wow Sues, I love this recipe…and my mouth is watering over it…simple and yet so good! 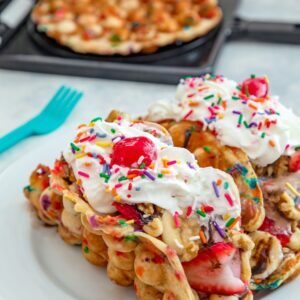 This is one of my favorite breakfasts! And beautiful, to boot! Love grocery delivery-it’s a life saver! Also, weekends need to be longer, and this looks amazing!! !